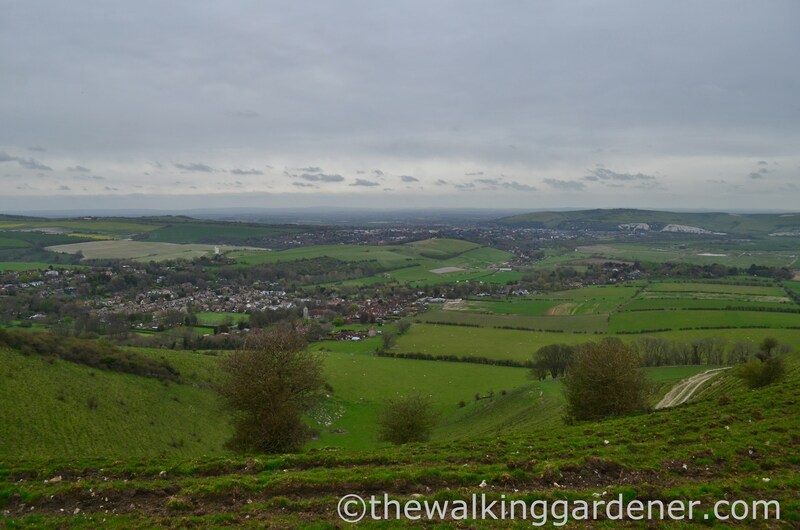 The sun absolutely refused to shine today but, given the good weather I’d enjoyed since Winchester, it would be unreasonable to grumble. I grumbled unreasonably. 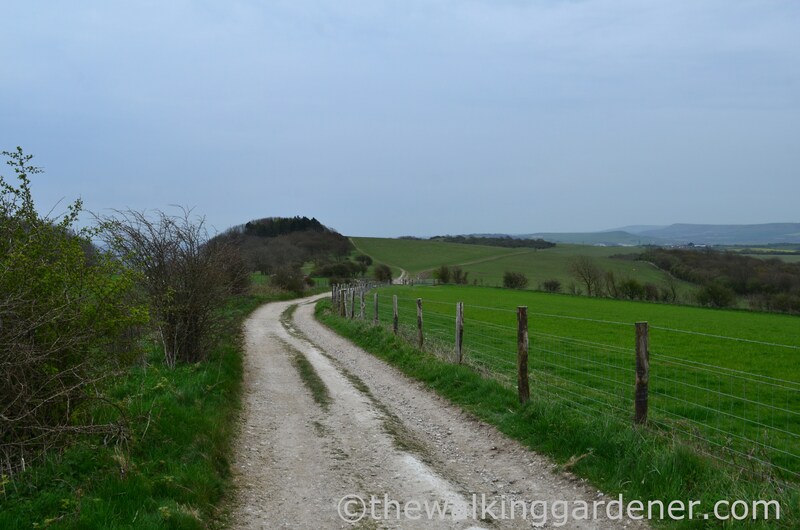 You see, today’s walk would lead me along a stretch of the South Downs Way I know very well and I wanted to show it off at its best: all blue skies; stark, white clouds and distant views of the sea. But sadly, under a thick grey mantle, the light was rubbish for photos. Oh well, you’ll just have to take my word that from Pyecombe to Southease, the SDW is more dramatic and beautiful than my photographs allow. 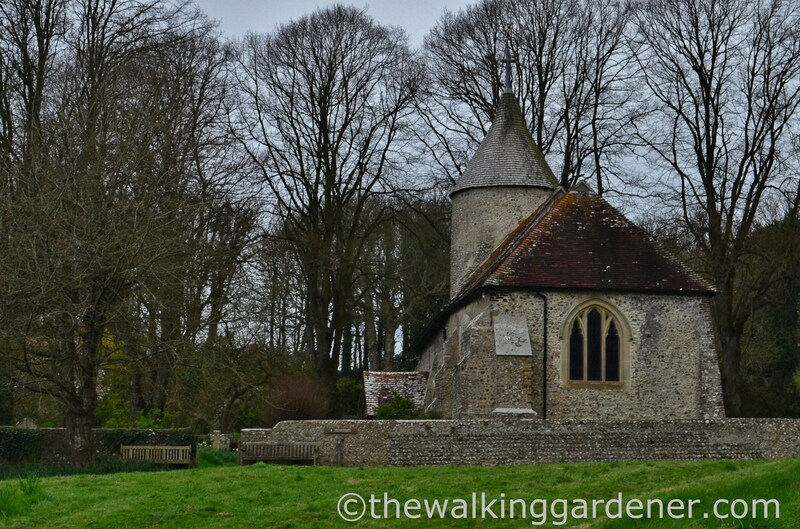 After a hearty breakfast (of … muesli) and a half-hour drive from home, Jim dropped me outside Pyecombe church at 8.30. We bid each other a tearful farewell – for at least eight hours – and I marched away, staunchly not looking back. if across a golf course. I dislike walking on courses; especially so after hard, white, spherical missiles have twice whizzed by my ear on earlier walks. 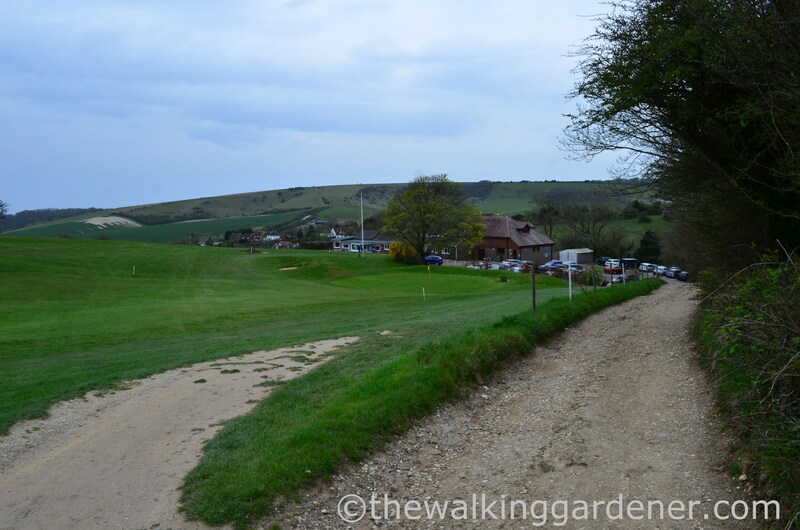 Don’t always assume, as I did, that players will wait for you to pass, even on a public footpath, before teeing off. 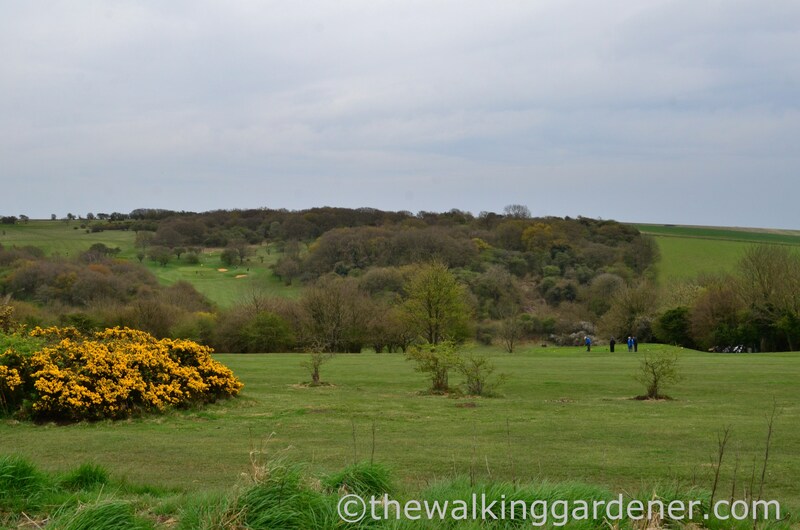 Flowering gorse, in the absence of sunshine, lit up the way ahead and soon I thankfully left Pyecombe Golf Club behind … without injury. 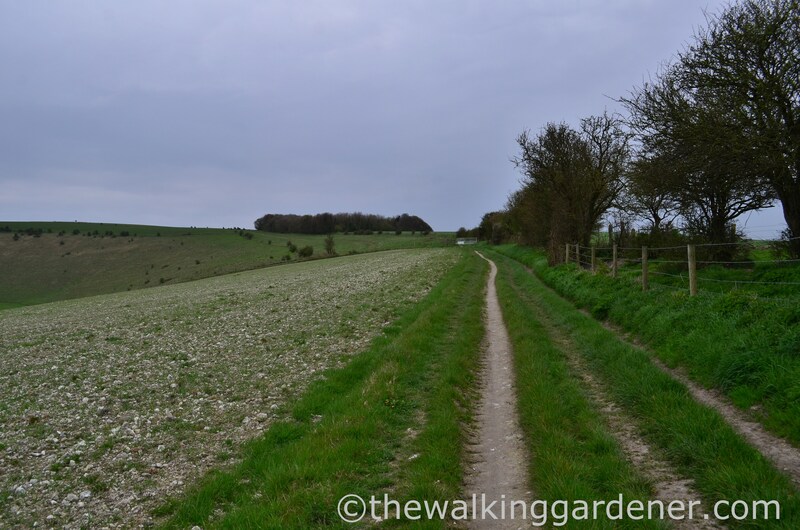 As I was now returning home each evening, I carried only a small knapsack and felt remarkably light on my feet, nimble even, without my heavy rucksack. A sign reminded me where I had come from and where I was going, if not who I was – which would be increasingly handy the older I get. Sign-posting on the ‘Way is excellent and especially so on this bit. Your sense of direction and path-finding skills would need to be pretty dire to go astray. Worse than mine even. 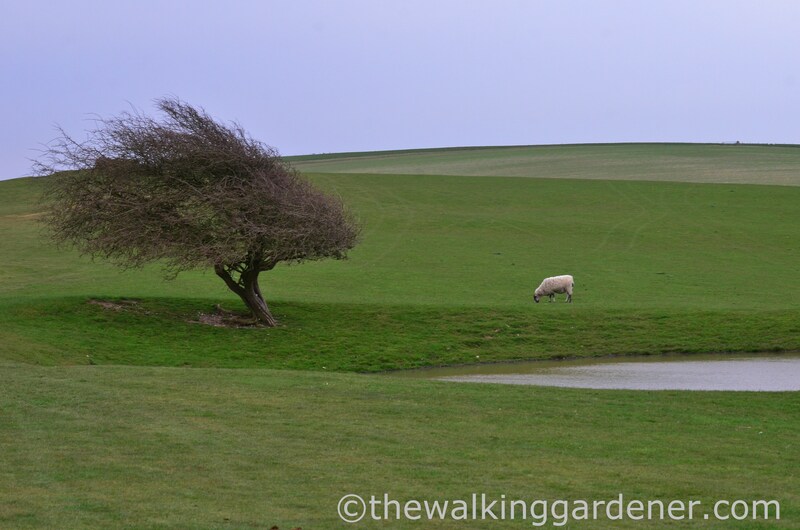 The nearer I drew to the coast, the more wind-sculpted trees I saw. 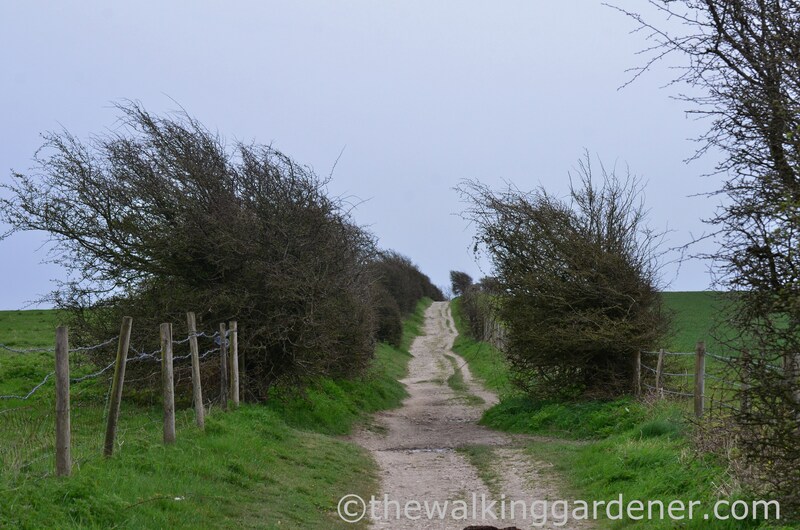 It looks as if these hawthorns have been bent over by the prevailing south-westerlies running in off the sea. They haven’t really: new growth and buds on the windward side are damaged and stunted, whereas on the leeward they are more protected. When I first learnt that, I remember finding it quite interesting but it probably isn’t. 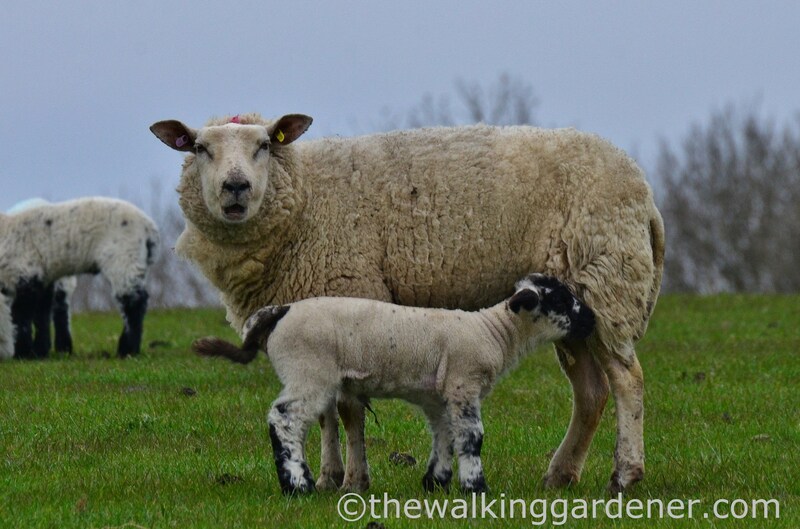 Downland turf, close-cropped by sheep, is probably the nicest, softest walking surface and a blessed relief if your feet are sore. When I started distance walking as a teenager, I assumed that blisters and bloody feet were an unavoidable consequence; but actually they were caused by not very good boots. Modern boot design is taken for granted nowadays but as I can’t remember the last time I suffered a blister, I think it bloody marvellous. 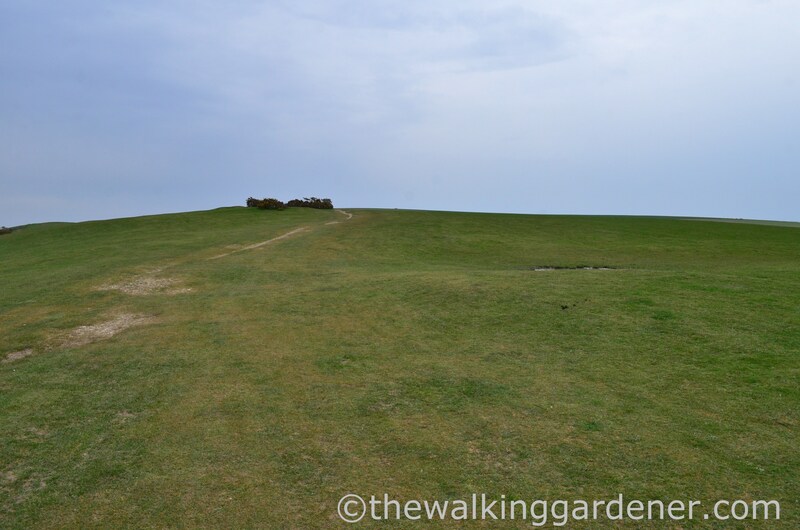 After about an hour, I reached Ditchling Beacon, the highest point in East Sussex (248m). 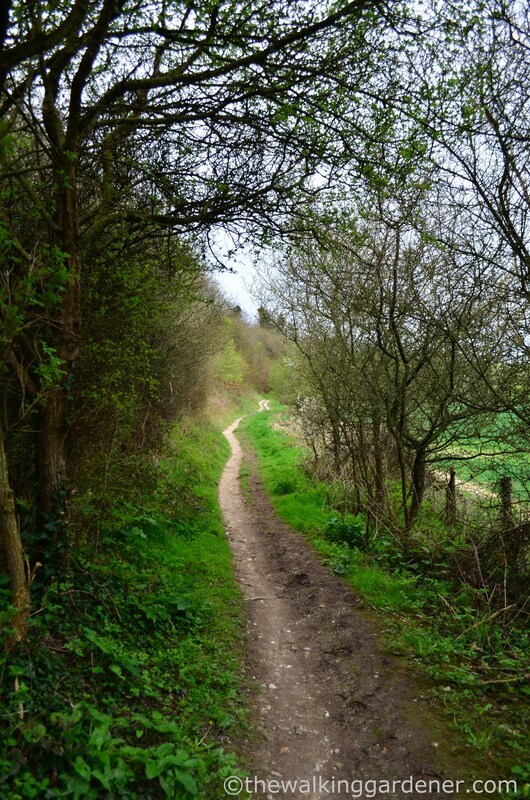 In the ’90’s, I volunteered as a South Downs Ranger and spent a Sunday or two each month on conservation work: clearing paths, pulling up ragwort or “scrub-bashing”. 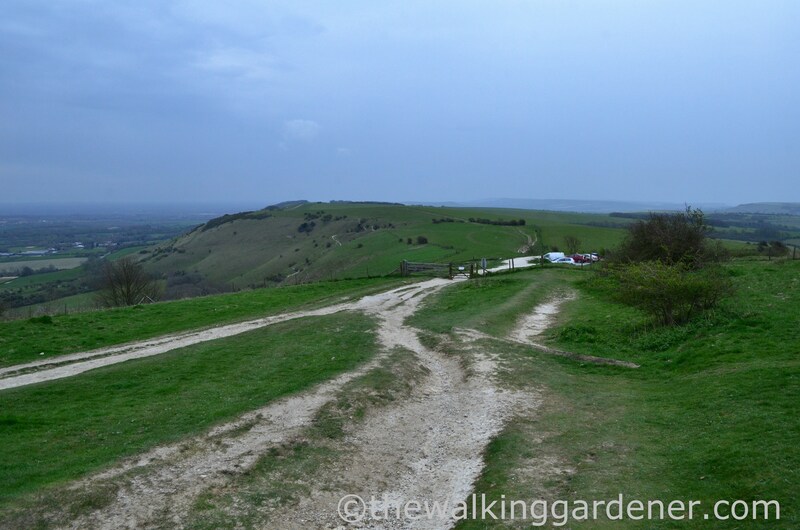 I also attended various courses and learnt about honeypot sites, of which Ditchling Beacon car park is a good example: it attracts many visitors who mostly don’t stray more than a couple of hundred yards from their cars. 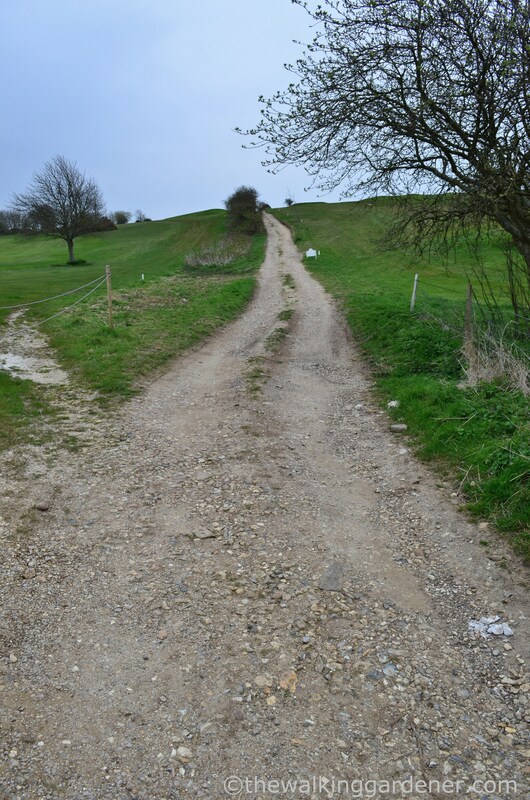 Compared to surrounding areas, honeypots suffer heavy erosion of grass and adjacent footpaths, higher levels of litter and dog mess too. Generally, I speed by them (unless there’s an ice-cream van). 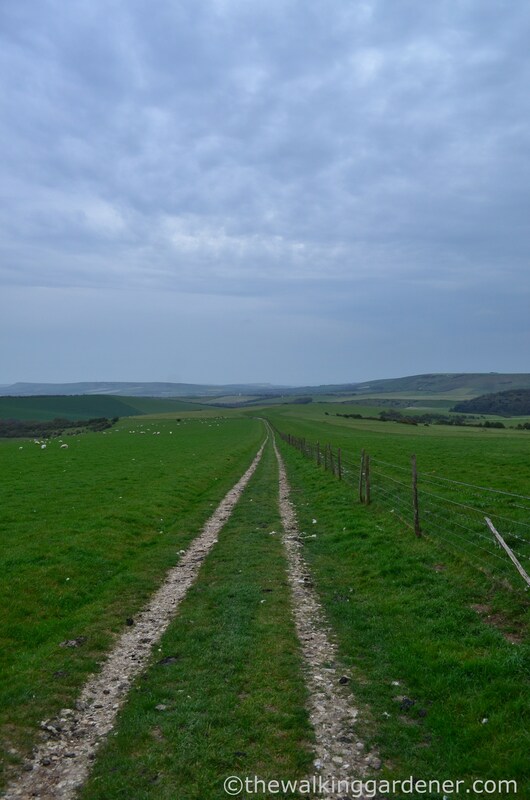 I crossed the Brighton-Ditchling road to follow the obvious, straight path towards Lewes and left behind the few dog-walking honeypotters. 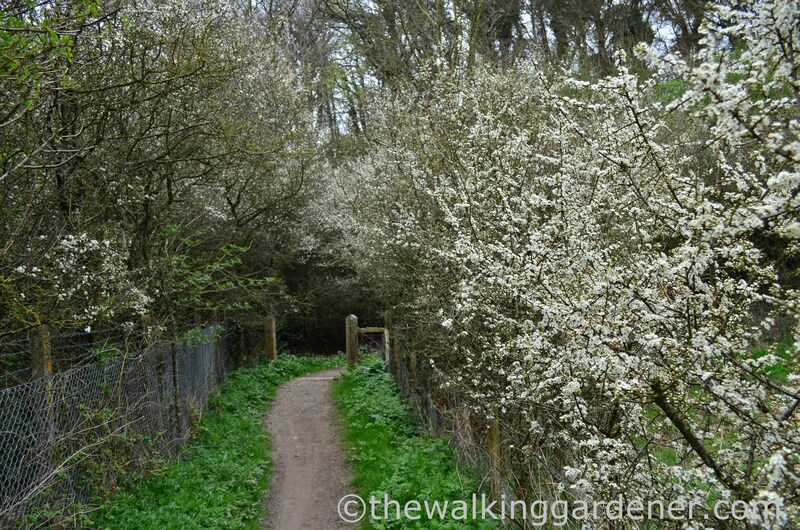 I’ve walked this length of path countless times; usually on Sunday afternoons with friends and family; or alone with my dogs in a vain attempt to tire them out. 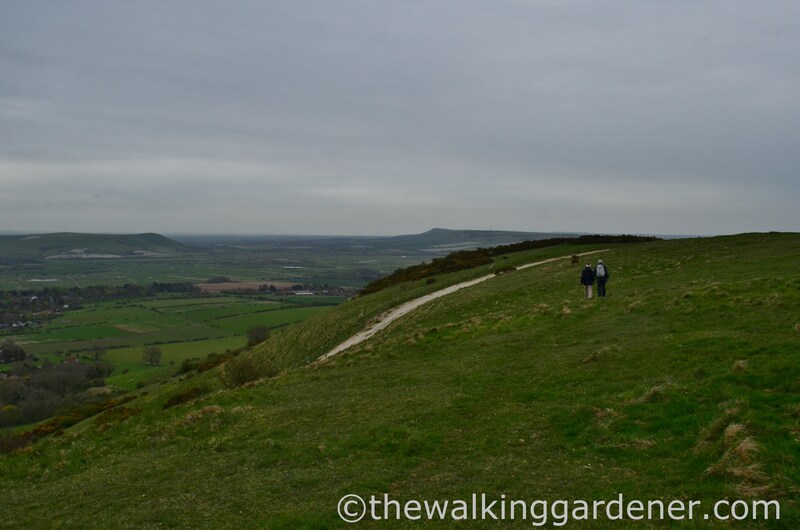 Two and a half miles east of Ditchling Beacon, the SDW turns sharp right toward the coast. 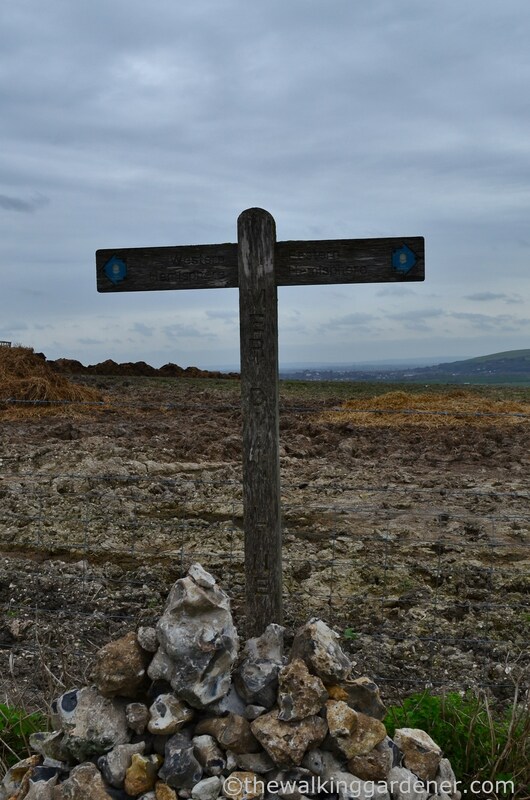 It’s at this way-marker that over-nighters for Lewes, the county town of East Sussex, can leave the SDW and march straight on. There’s no denying that today’s weather was the least satisfactory of my six days but despite the forecast, it didn’t rain. And to cheer me up, I was looking forward to meeting my friend John. Though we were at school together and have been friends for 40 years, I’d barely seen him since the Millennium. 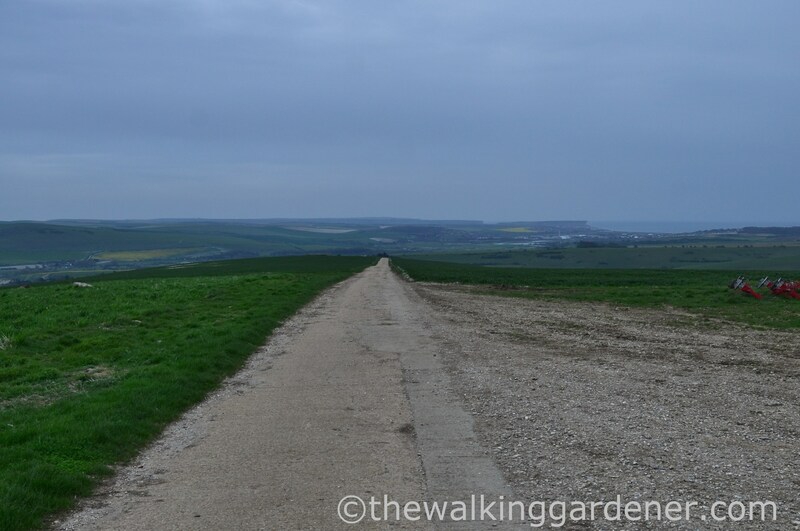 On the skyline, halfway between the hump of Kingston Hill and the masts near Woodingdean, was the spot where we’d arranged to meet. I passed some rare distance walkers but they didn’t stop to talk; only greeting me with a muttered hello or a tired smile, before disappearing over the near horizon. I guess they were on an outward bound course … whilst looking like they rather wished that they weren’t. 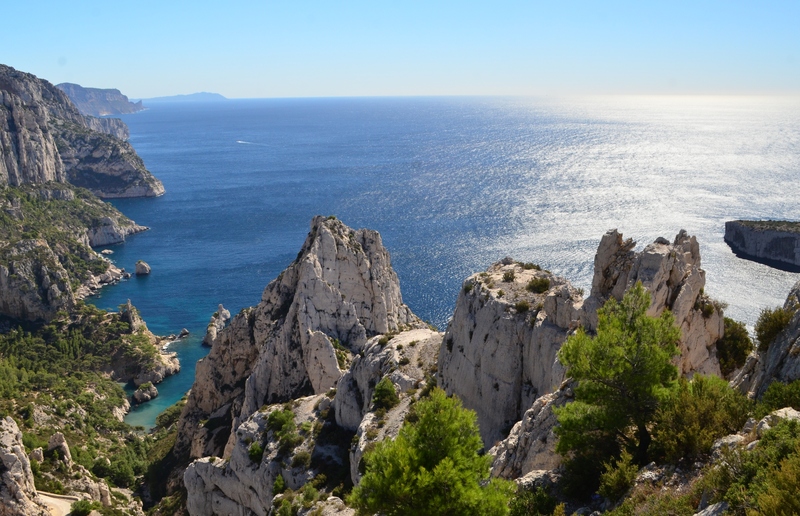 As well as being a relatively short day, there are only two significant climbs. 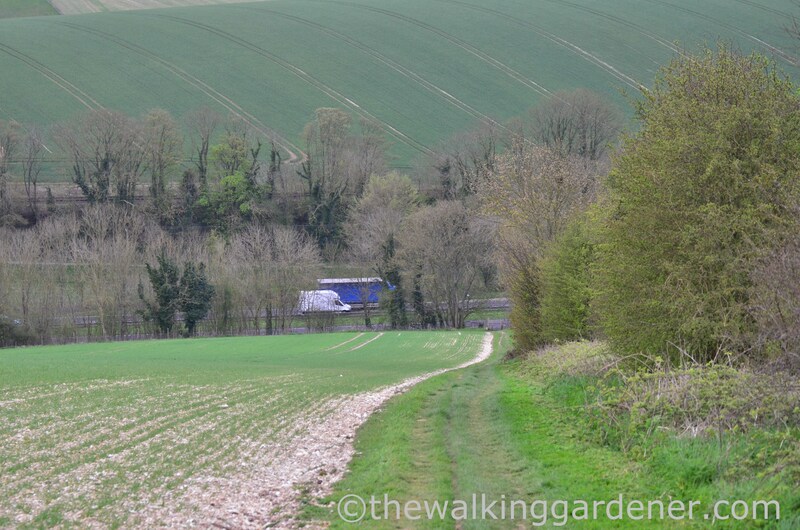 And here is the second – a sharp drop to cross the A27 and then straight back up again, past triangular Newmarket Plantation. The main Lewes to Brighton dual-carriageway is very busy but a short detour leads to a footbridge and a non-life-threatening crossing. 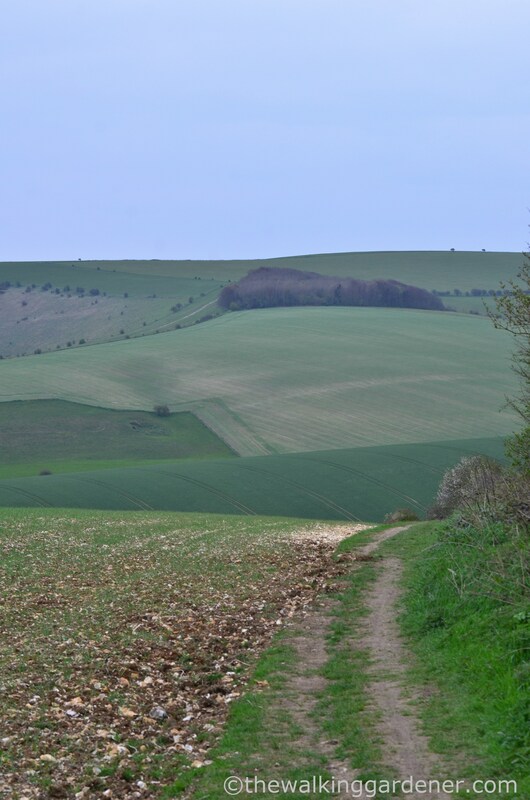 I had only 6½ more miles before the railway halt at Southease but first that climb up to Newmarket Plantation and Kingston Hill. 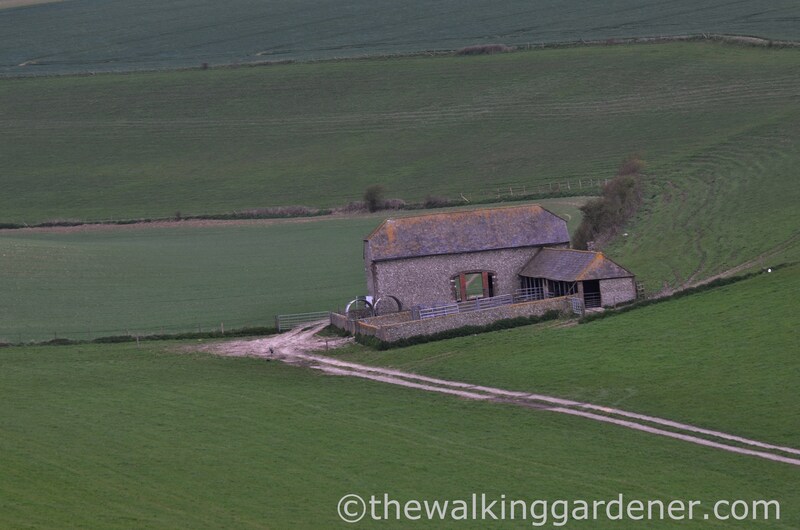 past New Barn in the valley of Loose Bottom: a lovely example of a flint Sussex barn, built at an intriguing angle. At the top, and a little after midday, I sat on a tussock and waited for John. He soon appeared and after plenty of arm thumping and back slapping, we fell into easy conversation and, distracted, I took fewer photos still. 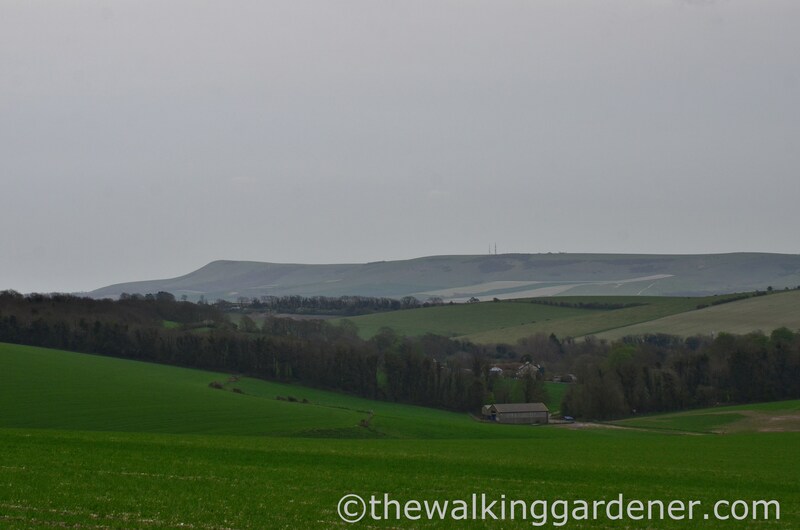 We walked along to Kingston Hill (that isn’t us) to look out over the Ouse Valley, with Mount Caburn on the left and Firle Beacon directly ahead. 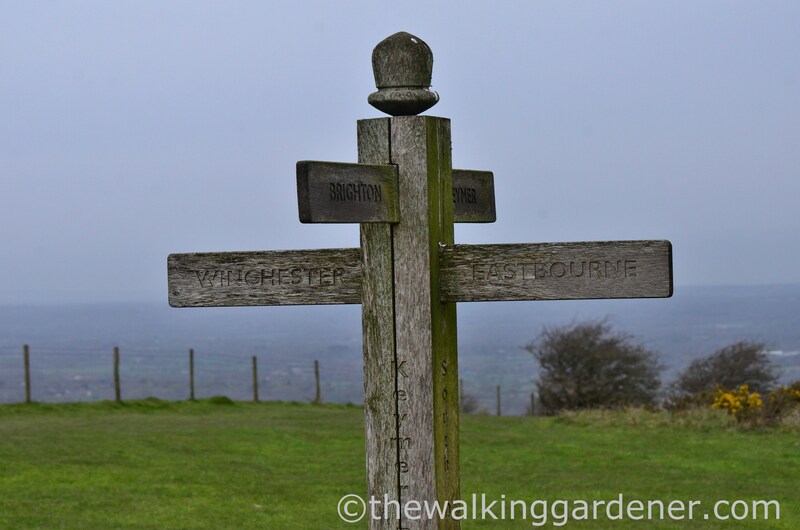 The South Downs Way goes over the latter and I would stand by its trig point tomorrow. and passed the Greenwich meridian line, about which I can’t think of anything to say. It is what it is. and a long-anticipated, late lunch stop at the The Abergavenny Arms. 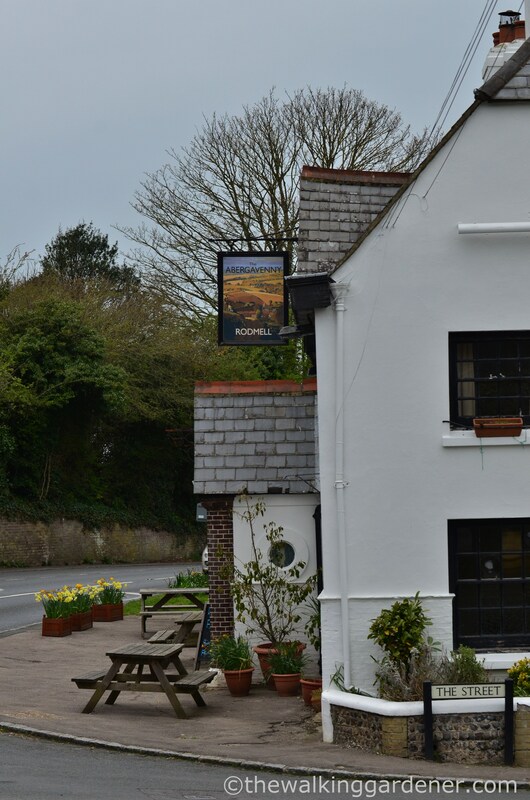 Rodmell doesn’t sit on the SDW but I think this slight diversion is better than the designated path, and the pub is a very good one. If you’ve time, and it’s open, Monk’s House – the home of Leonard and Virginia Woolf – is nearby and perfect for whiling away an hour. John and I stuffed ourselves rigid with haute cuisine (ham, egg and chips for me) and over two pints of Harvey’s Sussex Best Bitter, we easily solved most of the world’s problems. 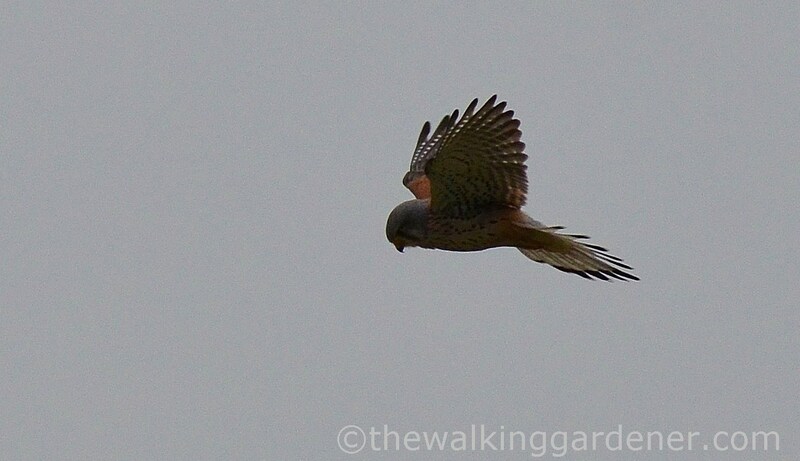 Afterwards we waddled on for the final mile, passing a show-off display by this male kestrel. 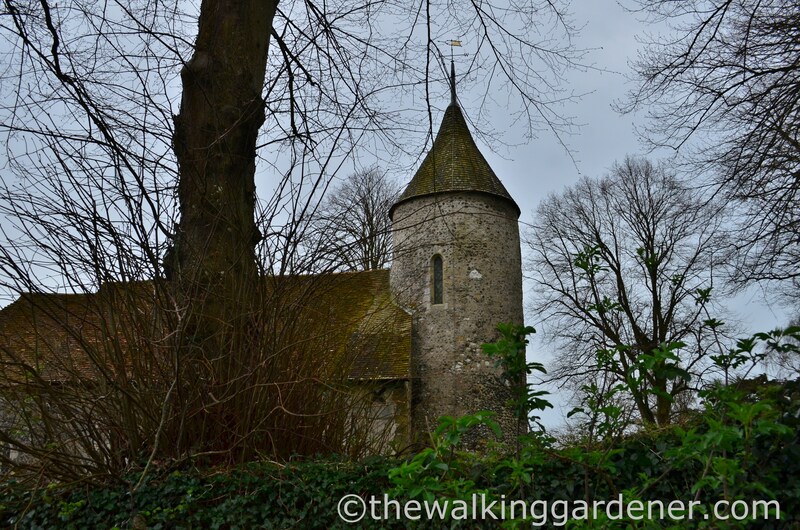 Southease church is one of only three in Sussex with a round tower. 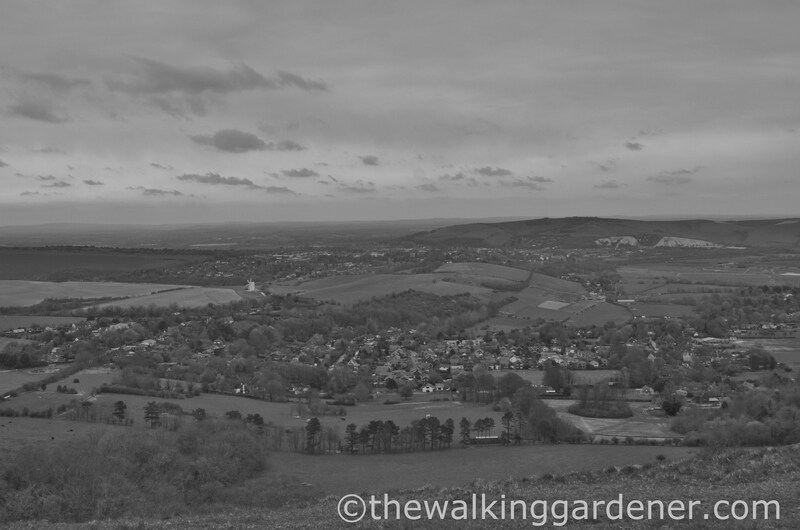 (The other two are close by: in Piddinghoe – a couple of miles downstream – and Lewes). Each year, the village hosts the Southease Open Gardens Fete. There are five gardens to explore and cake in abundance, with all proceeds going to the upkeep of the church. It is an archetypal English afternoon and a fine day out. Shortly after leaving the clutch of cottages about the church, a bridge carried us across the Ouse. 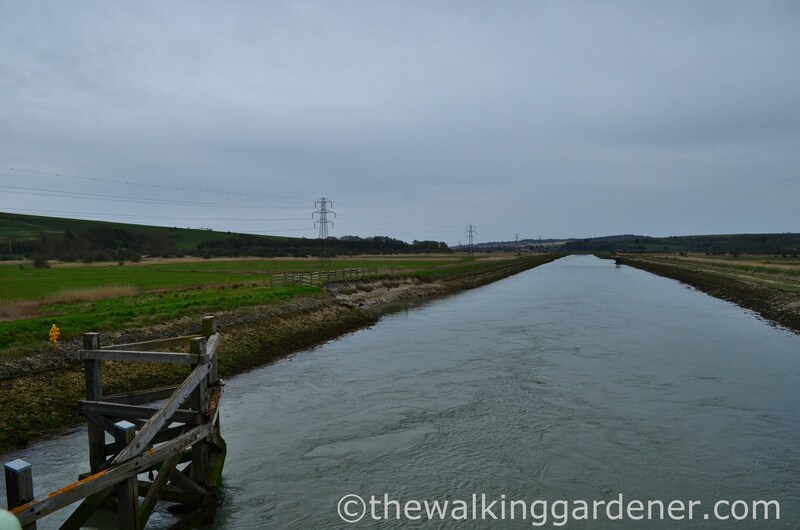 It was at this bleak spot that Virginia Woolf’s body was eventually found, three weeks after her suicide by drowning. I never cross it without sparing her a thought and suppressing a shudder at her awful, final state of mind. On a lighter note, Southease Station is just beyond the bridge and the natural end to this section of path. 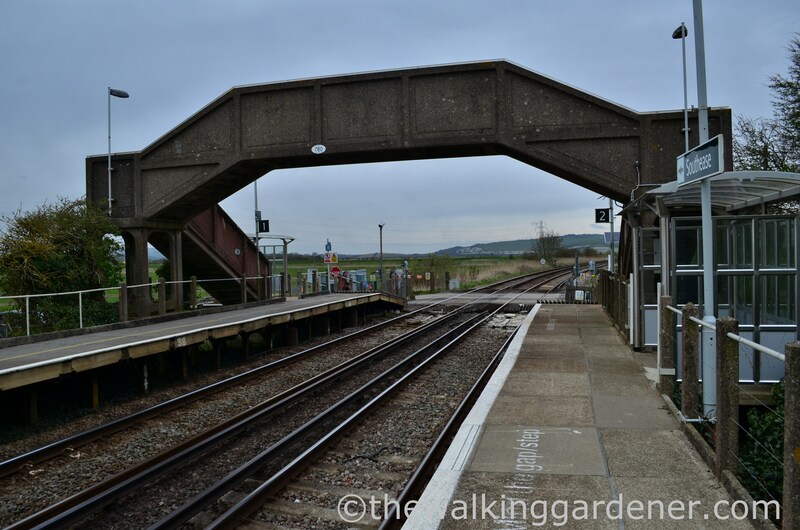 Hourly trains run north to Lewes and Brighton; or south to Newhaven and Seaford. 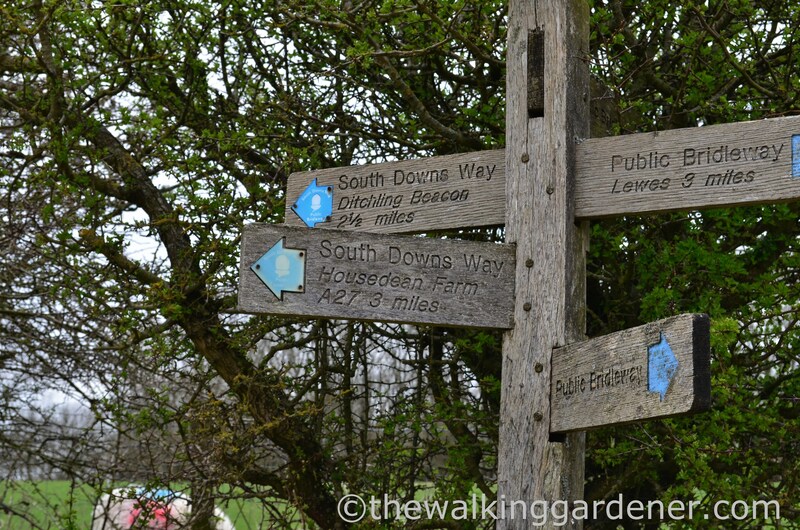 Alternatively, there’s the brand new Youth Hostel South Downs nearby. I waved goodbye to John as he disappeared on a train to Brighton, and hopped on my own train southwards, followed by a mile’s walk to my front door. If today’s weather had been a sombre disappointment, tomorrow’s final leg to Eastbourne would compensate with a return to sunshine. 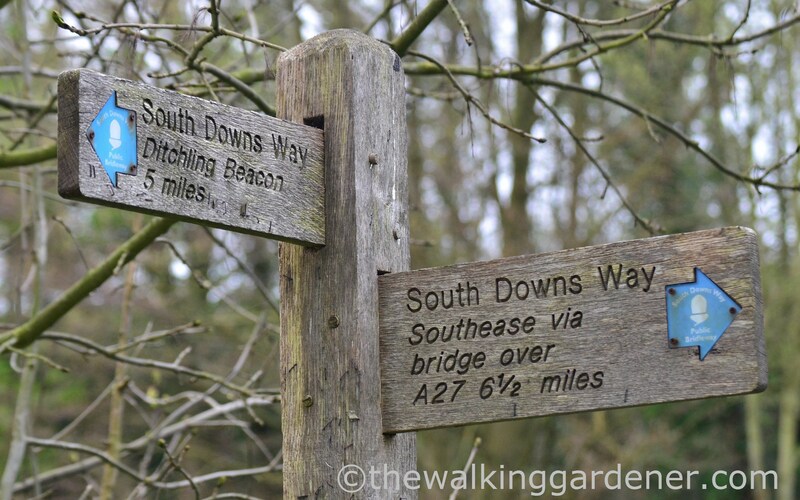 The last day on the SDW is a grand finale and one of the finest of any National Trail. Near perfect weather would make it finer still. And I managed some better photos too. All that greenery actually shows beautifully against gray skies. 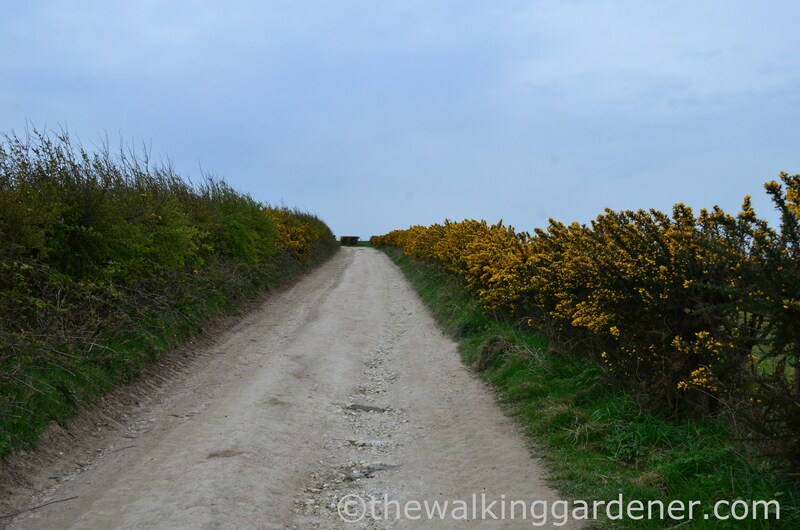 (So does gorse-ry.) 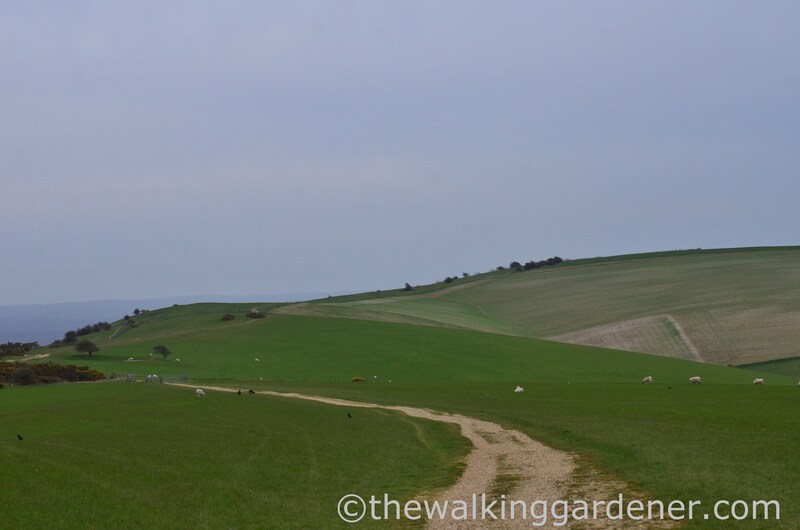 When you mentioned walking across downland turf my first thought was a panicked “but what about the prickly pears? !” Then I remembered not everyone worries about them. 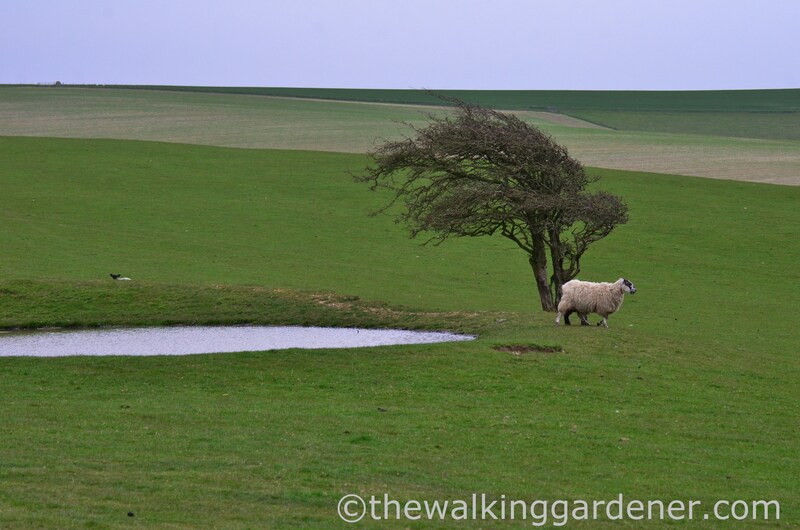 Lovely walk and write-up, Dave—and how perfect, to meet an old friend for a long, cross-country ramble. Years ago I read a book on the creation of worldwide standard time (Time Lord, maybe? )—what an intriguing mishmash of science, reason, empire, and convenience that was. I gasped excitedly at your photo of the meridian line. Drat and double drat. I honestly thought that if I started a long para re the Greenwich line, people would doze off. I’m interested in it too (I read a book called ‘Longitude’) but didn’t think anyone else would be. Sorry, Stacy – it is indeed a glorious mishmash and I missed it! Sigh. But I gave you a gasp, so that’s almost good enough. 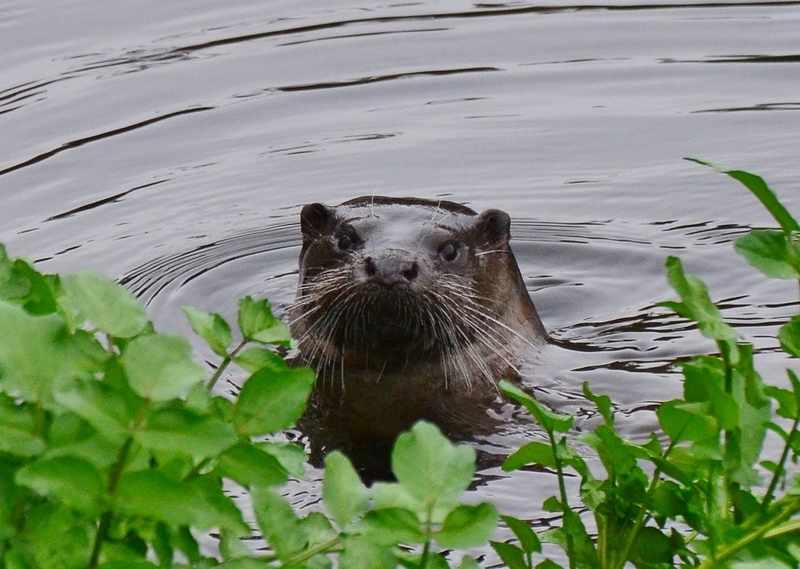 (Shame it was such a dreadful photo – which I almost omitted). Sorry to be dense (words I use a lot) but I don’t get the downland turf and prickly pear connection. Is there one? No, no—I’m sorry to have been vague. The whole thought of walking cross-country through grass sets off “danger” buttons here, because grass is full of cactus. I hadn’t realized how built-in that response had become until you talked about walking on the turf and my first thought was, “NO! You’ll hurt yourself!” I just had a moment of “desert vs. everywhere else” cognitive dissonance. Wonderful post. I’m hoping to do sections of the south down way myself over the coming months. Just relies on the trains playing ball! Re: blisters, however. You can rest assured that they still exist. My feet bear the scars from numerous battles with ill fitting footwear. Southern Rail is driving me nuts and so I sympathise with your worry. I can’t believe this fiasco is going to last much longer (but then I thought that 6 months ago). 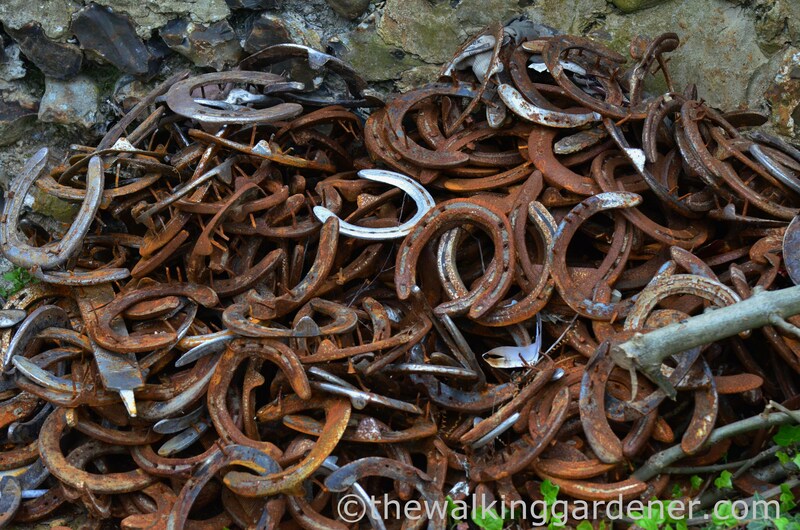 Can you tell us about the horseshoes? Were you passing a smithy or instead a spot where, for some reason undreamed of by non equine types like me, shoes and hooves are wont to part company? How did you manage to get the pic of you and John at such a distance? Or was it two other people who, in a sense, are suggestive of you and John? Did you think about a joke on Loose Bottom and discount it beacuse you didn’t think anyone would find it funny? Of course, having had a very loose bottom myself on a long walk I do accept that it is no laughing matter. All I can say is that every time I read your accounts of perambulatory excursions I want to pack a bag and head out to see that countryside… Really hope you’ll consider either leading a small group once in a while, or publishing a collection of your rambles… Or both : ) I’m sure there are many like me, who would savour your delightful photos, wry humour and pertinent points to guide the hapless wanderer.. all collected in a portable package to accompany either virtual or actual excursions..